In light of the armed conflicts sweeping large areas of the Middle East and North Africa, as well as the escalating violations of human rights, Euro-Mediterranean Human Rights Monitor has been integrating youth in human rights advocacy through a project titled, “Summer School on Armed Conflict and Human Rights”, which takes place in a different capital each year. The project targets students and graduates of the Faculty of Law in the MENA region in general, and in conflict areas (e.g. Syria, Yemen, Iraq, Palestine, Lebanon) in particular. 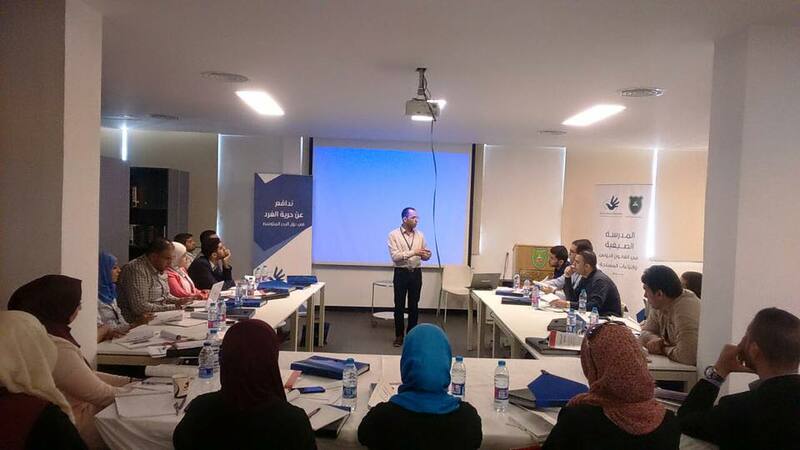 Participants attend a two-week summer school where they receive extensive training on international law and international humanitarian law, documentation tools and mechanisms, conflict resolution methods, tools for defending victims’ rights as well as integrating marginalized groups in the society. The sessions are led by local and international experts, representatives from local and international organizations, as well as Euro-Med Monitor’s advisors in Europe and the MENA region. Integrating the youth in conflict areas in human rights work, in addition to raising awareness about mechanisms to defend their rights and the rights of their communities. Building trainees’ capacity to document human rights violations as well as convicting perpetrators and defending victims’ rights. Developing participants’ capacity to transfer knowledge and share experiences within their communities. Providing participants with the necessary skills to network constructively with other human rights organizations, including international organizations such as the United Nations and its human rights bodies. Making participants fully aware of international accountability and justice rules and mechanisms in contemporary international criminal law. - International humanitarian law and its various applications. - The difference between concepts of occupation and internal armed conflict. - The principle of distinction in international humanitarian law. - The principle of proportionality in international humanitarian law. Once participants have completed the meetings of the Summer School on Armed Conflict and Human Rights, a number of young women and men are nominated to join the Euro-Med Monitor. Joining Euro-Med team means that these nominees are exposed to urgent humanitarian issues and legal problems faced by conflict victims such as migrants and asylum seekers. In addition, participants are involved in following up on issues that make up the focus of Euro-Med, including defending individual freedoms, as well as engaging in pressure and advocacy campaigns aimed at urging governments to address the human rights situation in accordance with their obligations under international law.